Last year, IndexCreditCards.com warned about the risks posed by medical credit cards in "Dangers of medical credit cards enough to make you sick." This followed a consumer alert issued in November 2013 by New York attorney general Eric T. Schneiderman, who advised patients not to be rushed into committing to agreements for these products. Some doctors' and dentists' offices use high-pressure sales techniques to push consumers to sign up on the spot to terms and conditions they don't fully understand. In the words of the alert: "Give yourself time to understand the terms of financing. Take the time to read the entire contract; don't rely on a sales pitch." Now, a new report, published on July 22 by Consumer Action, suggests even those who follow that advice may not be adequately protected. Often, it alleges, critical information contained in these credit agreements is hidden or incomplete, meaning even the most diligent patient may end up taking on obligations he or she doesn't fully understand. In 2013, federal regulator the Consumer Financial Protection Bureau took enforcement action against one of the biggest issuers of medical credit cards, forcing it to repay $34 million to consumers. At issue was a concept called "deferred interest." Some -- but not all -- medical card issuers offer extended deferred-interest periods ranging from six to 24 or 25 months. During this time, you're charged a zero-percent APR. That sounds like the deal you get from balance-transfer credit cards, doesn't it? But there's a big difference. With these deferred-interest medical products, you MUST pay back the full amount due within the stated period, which is highly unlikely to happen if you make only minimum payments. Otherwise, you don't just have to pay interest in future on the remaining balance when the introductory rate ends (as is the case with balance-transfer credit cards): You have to pay all the accumulated (or "deferred") interest you would have paid during the introductory period. No, really. If you're a day late -- or a cent short -- clearing your balance at the end of the introductory period, you have to pay as much as you would have had there never been a special offer. And that can be an awful lot of money. The go-to APR (the one that's charged when no offer applies) is commonly 26.99 to 28.99 percent, according to a June 2014 report from the United States Government Accountability Office (GAO), although at least one issuer has a rate as low as 9.99 percent. Fair enough, you might think: Consumers should shop around. After all, that's how capitalism works. But when Consumer Action researchers tried to find rates on these issuers' websites they failed in three cases. "Despite laws that require lenders to give consumers the information they need to compare financing offers, it's often virtually impossible to get the rates and terms for some medical credit cards," Linda Sherry, Consumer Action's director of national priorities, observed in July 2014. "How can consumers make an informed decision?" Unless you're rich, it's not easy to keep a cool head when you're in a dentist's or doctor's office in need of treatment for which you're uninsured or for which a co-payment is required. You're dealing with people to whom you entrust your health -- indeed, your life. How can you question their advice over relatively minor financial matters? Well, ask yourself this: If your accountant or bank manager offered to perform your open-heart surgery or root-canal treatment, how would you react? Read the contract for the product recommended by the practice. Only some (although quite a lot) are dangerous to your financial well-being. If the one proposed involves deferred interest, or if you can't easily find that "go-to" rate, discard it. Explore zero-APR credit cards. These can currently provide up to 14 months' interest-free credit on purchases, including medical treatments. And, if you haven't finished paying off the balance by the time the introductory deal ends, you shouldn't be unduly penalized. However, just like medical plastic, you do have to be sure to make every minimum payment by its due date, or you risk penalties. If you need to spread payments over a long period, check out low-interest cards. At the time of writing, it's possible to pay just 7.25 percent APR (though that's variable) as your standard rate, which could make your treatment affordable. Talk to your bank or credit union about a personal loan, or consider a home equity loan or line of credit. All of these are usually considerably cheaper than any plastic. 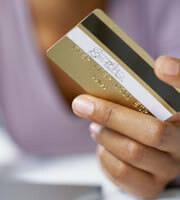 A good or great credit score is likely to be a prerequisite of most of those four alternatives. If you don't have one of those, and your treatment is essential, by all means consider a medical credit card or installment loan -- as long as you're extremely careful about choosing the right one. One last thought: The GAO notes that medical credit cards are often used for non-emergency services, "such as dental and orthodontic procedures, eye correction surgery, audiology care, cosmetic procedures, and hair removal or restoration." And it may be that your particular need is urgent. For example, many attending heterosexual weddings prefer that a maximum of one of those being married has a mustache. But a cosmetic dental or breast implant -- or a nose job or similarly ego-boosting procedure -- may not always be as urgent as you first think. If you can possibly live with your issue for the time it takes you to save up enough to pay cash for the necessary procedure, you stand to avoid some serious expense -- and, potentially, some nasty financial problems. Coping with unmanageable debt can leave more painful -- if less visible -- scars than surgery. 0 Responses to "WARNING: Medical credit cards can seriously damage your wealth"